Today I made my 'road' race debut. 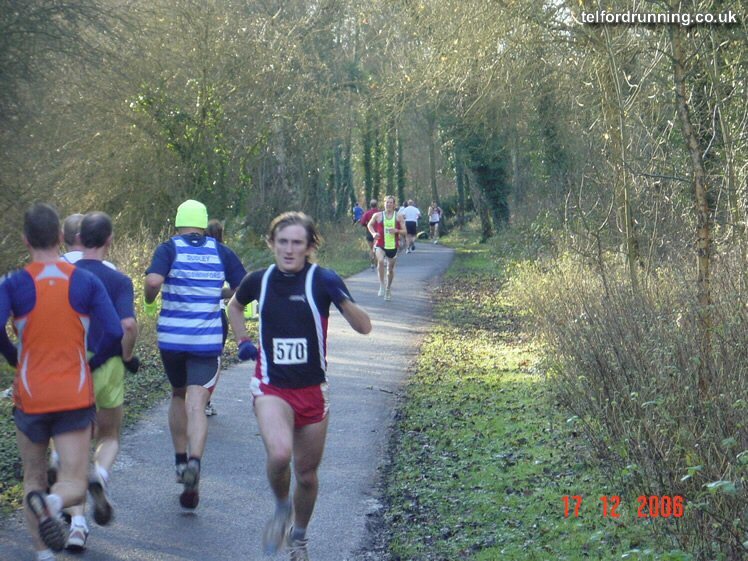 I have run a few road relays at various distances, and I ran a couple of fun races when I was a junior, but I have never run a serious road race at a 'proper' distance until today. I took part in the Telford 10km, which was run around Telford Town Park. 2 laps of the same course, it was all on surfaced paths with one small climb on each lap. At the far end of each lap, runners had to turn around a post and continue in the direction they had just come from - it wasn't so nice to have to basically stop running and then get back up to maximum pace again, that was probably the hardest bit. I did the race partly out of curiosity and partly out of having a time that I can compare with over the next few years to guage my shape. I have to say that aerobically it was one of the hardest workouts I have ever done. My legs felt fine but my lungs were burning from about 2km. I haven't done any specific training for this race, and I didn't rest up at all during the week (apart from a rest day yesterday - my first day without any exercise for about 3 weeks), but I did try my hardest. Having no idea of how to run the distance, my goal was to run a steady pace and take splits every mile (for some reason the course had mile and not km markers). That lasted all of 5 minutes though as I went off way too fast at the start gun. My first mile was more than 20 seconds quicker than any of the others, and on the second lap what seemed like a small bank the first time turned into a huge climb (all of 10 metres!). I went through 5km in 16.06, 5 miles in 26.31 and 10km in 33.08 (almost 4 minutes down on the winner who ran 29.18). While I have nothing to compare it against, it felt like the first 5 km was pretty fast and the second was horribly slow. I am a bit disappointed having got so close to 33 minutes not to get under, and I was overtaken and left for dead at about 7km by a guy who looked worryingly like a veteran at least twice my age and possibly quite a bit more. Still, it's a benchmark for me to work on, and I intend to knock about a minute off my time and get close to 32 minutes by next summer. I came 75th in 38:00 dead. I hit the wall quite dramatically in the last mile and lost 25 secs. Incidentally, the last time I did a 10k was ten years ago when I was 15 - strangely my time then was also 38mins dead! You should be pleased with the run, not bad at all for a first attempt. Dont think I'll ever get near your time, especially since I do no training whatsoever! Seriously though well done today (both of you, put particularly gg). Good effort! haha, you'll be pleased to find out that when i made my 10km debut last may i ran 33:03! The power of 10 website also suggests thas you're in the top 30 in the West Midalnds which ain't too shabby for a first attempt! Great stuff, well done!